One way the Zika virus is spread is by Mosquitoes of the Aedes genus, which can breed in a pool of water as small as a bottle cap and usually bite during the day. The aggressive yellow fever mosquito, Aedes aegypti, has spread most Zika cases. That mosquito is common in most of the tropical world and in the United States only in Florida, as well as along the Gulf Coast, and in Hawaii―although it has been found as far north as Washington, D.C., in hot weather. The much more aggressive Asian Tiger Mosquito (which is prevalent worldwide and in Florida’s Everglades), Aedes albopictus, is also known to be a prime transmitter of the Zika virus, but it is not clear how efficiently yet. That mosquito ranges as far north as New York and Chicago in summer. This is the mosquito most likely to bite at pool parties, outings or on the patio day or night. The spread of the Zika virus throughout the rest of the world is equally eminent and growing with new reports surfacing daily. The mosquito will be the main transmission of Zika, the guppy can be the easiest and cheapest preventative precaution against the Zika virus. These pests and now more dangerous than ever, Zika virus spreaders, Mosquitoes, are spread by means of laying eggs which quickly mature into larvae, evolving into full stinging Mosquitoes very quickly. If there is a still body of water, any water, they will breed! Guppies, in spite of their tiny size, are useful citizens of whatever body of water, pond or stream they have been introduced to and inhabit. Specifically, one of their favorite foods is the “mosquito larvae” and mosquito eggs. This tropical fish, the Guppy, is able to eat almost their total weight of “mosquito larvae” every day! Whether you have a full goldfish pond or just a birdbath in your backyard this summer, you need Guppies. If you have an old pond you have forgotten full of standing water, you need Guppies! As, in nature, this little gem is always prolific; they are known in the West Indies as “million fish” for a very good reason. If you put 5 or 6 females and a few males in a body of water at the beginning of the warm season (water temperature at least 65 F), within 6 months, under ideal conditions it is possible to have thousands of Guppies appear, it will seem like millions of the little mosquito eating gems. The sum total of their efforts in mosquito control made much of Florida inhabitable in the 19th century, as well as many other areas of the world. The extent of their contribution is debated but they seem as desirable in nature as they are in the aquarium. Yes, the ​guppy is an invasive species in almost every corner of the world, but one that has worked out well in almost every instance. “In Mangalore, a port city in southwest India, school children and volunteers hope to curb the occurrence of the disease of malaria via the guppy movement, a campaign that aims to control malaria by using a rather peculiar but natural means of eliminating mosquitoes using guppies. The Guppy, a freshwater fish popularly kept in aquariums, eats mosquito larvae and eggs and thus helps reduce the spread of malaria as the disease is caused by the parasite Plasmodium, which is transmitted to humans through mosquito bites. As a means to control mosquitoes, the guppies are left in stagnant water puddles where mosquitoes breed. The fish then eat the mosquito eggs and larvae, leading to reduced mosquito population. Nripendra Kumar Sarma from the public health engineering department said that bio-control helped Assam significantly reduce its malaria cases. "Till 2012, we had over 30,000 cases each year. But now they are no more than 3,000-4,000, in areas where the Guppies were introduced. This approach can very well be initiated in areas (of the country) that are prone to malaria, dengue and Zika, all of which are mosquito-borne diseases," Nripendra Kumar Sarma said. If you have goldfish in the pond, they will not hurt the guppies in any way, they won’t even notice them. But remember goldfish will not eat mosquito larva or their eggs. When the weather gets warmer and the water temperature gets over 60 F, go to your local pet store and get 3 to 5 very pregnant female guppies. You know they are pregnant by a large black gravid spot on the back underside of her belly, and a very fat “squared off” belly. 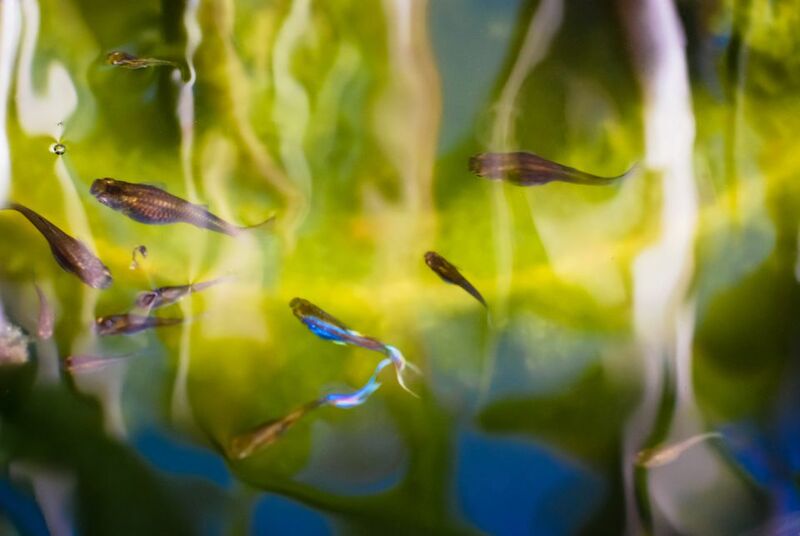 Once a female is impregnated she can have up to 6 broods of up to 80 fry (baby guppies) without being inseminated again. When the male inseminates the female, he deposits a “packet” of sperm, this “packet" will re-impregnate her over and over. In nature, guppies live on flood plains and get flushed from puddle to puddle, they may never see a male again, and they really don’t need to. The females are the ravenous eaters, the ones that can eat almost their weight in mosquitoes each day, they are eating for 80 after all, the males are much smaller and actually lazy, and they have one purpose, you know what. When a guppy is born outside in a pond, with virtually unlimited food, they can be sexually mature in 3 to 4 weeks. So mom won’t be lonely long, this is also why it is said guppies are almost born pregnant. They do not mature this fast in an aquarium because of space, food, and nature. Do not worry about feeding Guppy’s outside, they will find a way, just leave them alone and be surprised. For added fun, get pregnant fancy guppy females, by the end of the summer, you will have a riot of color and a nice group to take into your home aquarium if you like. Any fish grown in an outdoor pond will be healthier, larger and more colorful than a fish you may buy in a store. But also remember that the fish you buy in a store were themselves most likely raised in a pond, on a fish farm, but not allowed to mature in the pond, they were taken out while still very small to better acclimate to the store where you bought them and then your aquarium. You will find some real surprises at the end of the summer; if you follow the simple guidelines we have set out here, and just let nature take its course. In the process, you will be keeping your family safe from Mosquitoes and end up with a great lesson in the nature of fish. Goldfish are vegetarians, they will not eat mosquito larva, and the Zika virus is no joke. Wherever you are in the world, get some guppies and put them in whatever body of water you have in your backyard or around your living area. It is a very cheap solution, and it may save your families a lot of aggravation or even their lives! Chemicals are bad for you, bad for wildlife and bad for the environment. The guppy solution is cheap, clean and totally environmentally friendly!